BLUE WATER INFLATABLE STAND-UP PADDLEBOARD! 11 Feet Tall, 34 Inches Wide, and 6 Inches Thick! 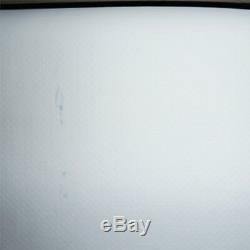 Discounted because of small grey streaks located on a small section on the bottom of the board. A mistake made by our factory that was not noticed during the inspection process. Below you will find a picture showing an example of what the marks look like. Please note that the marks are not alike so the location and size of the smudges will vary on each board. Again these are just painting smudges and do not affect the performance or quality of the board at all. This innovative Stand-Up Paddleboard is perfect for fun on the water. It is great for cruising, riding the waves, yoga, fishing, hanging out, and many other activities. The perfect choice for kids, adults, beginners, and advanced riders. 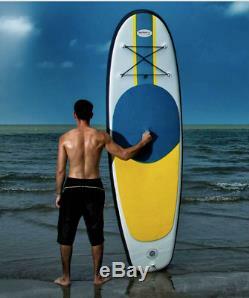 This SUP is extra large, has a 34 Inch width for maximum stability, easy to maneuver, and so much fun. The extra height and width will give allow everything to be easier on the water. Deflated for convenient storage in your trunk, garage or boat. Fits in the provided backpack so you can take it with you wherever you like. Easily inflated so you can enjoy oceans, lakes, or streams fast and easy with this fun versatile SUP. 11 Feet Tall and 34 Inches Wide! This is our Extra Large model board. The extra height and width make the board more stable and a lot easier to use on the water. Our Military-grade drop stitch construction enhances the performance and durability of the board. UV protected, extra comfortable and durable EVA pad, quality accessories, and overall strength gives you peace of mind that your paddle board will last and look great for many years on the water. This stand-up paddleboard gives you the sturdiness of a hard board with the convenience of an inflatable board. The lightweight portable design with extra large comfortable EVA non-slip pad for safety is a breeze to take anywhere. Use the travel backpack for easy trips to the lake, ocean or stream. Everything is a lot easier with this 28 lb portable SUP. Has a weight limit of 375lbs. 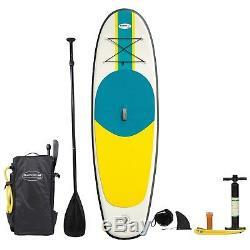 Set includes an 11' x 34"x 6" SUP, adjustable SUP paddle that floats, removable 3rd Fin, travel backpack, leash, high-pressure pump with psi gauge, hose, and 3 piece emergency repair kit. We use a 3 fin system and a 34-inch width design that gives you better tracking, stability, and maneuverability. It will enhance your overall enjoyment by a lot. We stand behind our products 100%. Einstein Innovations believes in quality first. Join the movement and get out on the water! Einstein Innovations is happy to be a part of your journey to excellence. Investing in paddling equipment means investing in your outdoor adventures. Paddle with trust, find your passion, refine your technique, and most of all enjoy your time on the water. Blue Water SUP 11 Foot Tall 34 Wide Inflatable Stand Up Paddle Board SUP Set.. Blue Water 10' SUP Inflatable Stand Up Paddle Board (KAYAK AND SUP) W/ Backpack. Blue Water 10' Inflatable Stand Up Paddle Board And Kayak Set! Blue Water 10 Foot Inflatable Stand Up Paddle Board With SUP Set. Blue Water Four Person 6 x 8 Foot Square Floating Deck/Lounge. Blue Water 10 Ft Inflatable Stand Up Paddle Board And Kayak Set 2 in 1 SUP+Kayak. Blue Water Six Person 8 Foot x 8 Foot Square Floating Deck/Lounge.